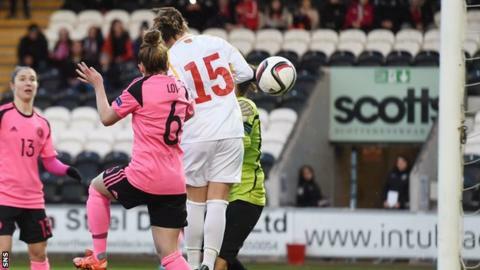 Stylish Scotland dismantled Macedonia 10-0 to sweep to the top of the Women's Euro 2017 qualifying Group 1. They were in control from the moment Jane Ross headed the first of her four goals only three minutes into the first outing for the new pink national kit. Jo Love completed a hat-trick of her own, with Jenny Beattie, Hayley Lauder and Lisa Evans also scoring. Scotland move three points clear of Iceland at the top of the group after four straight wins. Harder assignments await Anna Signeul's side, who started the afternoon level at the top with Iceland and await the visit of the top seeds in June and the return trip in September. But, while Macedonia looked every bit like a side sitting bottom of the group without a point and ranked 118th in the world, the Scots will take confidence from a professional display at a rain-soaked St Mirren Park. The Scots knew they were more than a match for the visitors, having already won the reverse fixture 4-1 last month. And Macedonia had no answer to an early hail of Lauder high balls, the Glasgow City winger's left foot proving to be Scotland's most potent weapon as they built up a six-goal lead by half-time. Her deliveries found the heads of Ross and Love as Viktorija Doneva's fear of crosses was exposed twice within eight minutes, although the goalkeeper did display good reflexes to turn a Ross effort on to the crossbar. Ross, Kim Little and Gemma Fay had all been presented with Uefa awards before kick-off for winning more than 100 caps. Celtic goalkeeper Fay was in danger of suffering frostbite she was so much a spectator, but Little was next to whip over a cross that was finished by Melbourne City team-mate Beattie. Lauder capped her fine display with a goal of her own via a deflection before her deliveries were finished off by Evans and Love. Love had moments earlier struck the crossbar, while Doneva produced a fine save to deny Ross. The Glasgow midfielder continued her scoring streak - she has scored seven times for her country, with five in this campaign - by finishing off an Evans cross. Signeul took the opportunity to bring on Lana Clelland and the former Rangers and Spartans midfielder grabbed her chance to impress in her sixth international. Clever thrusts forward from the 22-year-old, now plying her trade with Tavagnacco in Italy's Serie A, twice set up Ross for close-range finishes within minutes of coming on as a substitute. Beattie was denied by a post, while Lauder had an effort cleared off the line before a Little cross found Ross and the Manchester City striker's effort squirmed under Doneva's body. A fourth straight qualification win means the Scots have the chance to open up a six-point gap at the top when they meet Slovenia in March before Iceland take on Belarus. Scotland: Fay, Dieke, Love (Clelland 56) Lauder, Little, Weir (Crichton 56), Evans, J.Ross, Corsie, Beattie, Brown (Smith 71). Subs not used: Lynn, L.Ross, Arnot, Arthur. Macedonia: Doneva, Naumoff (Ristovska 60), S Andonova, M Arsova, Angelovska (Markovska 81), Andreevska, Rochi, Jakovska (Mileska 46), N Andonova, Bojku, Chubrinovska. Subs not used: Kostova, Saliihi, D Kostova, Pejkova.